Is it worth upgrading to an inverter air conditioner? With energy costs now running at approximately 26c per kWh and still rising there is no doubt this will save you $$s in the long run. What is the difference between inverter and non-inverter air conditioning units? Non-inverter or Fixed speed air conditioning deliver a fixed amount of power via a fixed speed. This means the compressor has to stop and start to maintain the desired room temperature. Inverter air conditioning system varies the speed of the compressors, delivering precise cooling or heating power as required. How does Inverter Air Conditioning work? The amount of cooling or heating required by an air conditioning unit varies depending on the outdoor temperature and the amount of heat in the room. When the cooling or heating capacity needs to be increased, the compressor will operate at a high speed and will increase the amount of refrigerant flow. Conversely, during moderate outside temperatures for example, when the cooling and heating capacity needs to be decreased, the compressor will operate at a low speed and will decrease the amount of refrigerant flow. When the inverter air conditioning is switched on, the compressor operates at a high speed in order to cool or heat the room quickly. As the room temperature approaches the set temperature, the compressor slows down, maintaining a constant temperature and saving energy. Any sudden fluctuation in the room temperature will be sensed and instantly adjusted to bring the room temperature back to the set temperature. Éclair inverter air conditioning uses between 30-50% less electricity to operate. 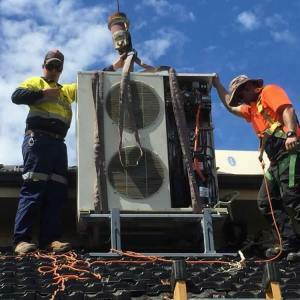 If you want to buy an Inverter Air-conditioner Just call AUSTEC ELECTRICAL .